So, where's the sea of clouds that they are claiming to be so amazing in Mt. Pulag. Where??? Again, where???? Hehe..
Guys, the hiking season is supposed to be over! It ain’t a dry season anymore. Oh yeah, it’s July! And it’s already rainy. Typhoons and tropical depressions are coming to the archipelago and these months, they usually pass through some portions of Luzon and Visayas. We’re actually in Letter G, right? Typhoon Gorio has just made its landfall last weekend and the Bicol and Southern Tagalog were the center of it. But many of the adventurous people and climbing enthusiasts I know never mind trekking inconveniently wet and soaked. They instead appreciate the rain. So how can you stop these passionate individuals from scaling those peaks they love to reach? The June to September of my 2011 and 2012 brought to my mind. I should have been at the mountains trekking and wandering around just like the previous two years. But this last weekend of June is different. I was staying at my apartment with my siblings, doing household chores and just hearing the “tikatik” sound of the pouring rains. I didn’t have a climb. Why am I saying all of these? Well, I just had a flashback of my stormy Mt. Pulag climb via Ambaguio-Akiki trails and I’d like to share with you about it. I couldn’t say we were pasaway ( modern Tagalog for stubborn) or we were just too eager and excited then to do this. Well, I got some points to defend ourselves. LOL. It was my first time to do an extra major climb in the far north. It was my second time to climb Mt. Pulag. But being a newbie, it was my first time to hear a trail called Ambaguio going to the said mountain. It was my first time to try some trails other than the popular Ambangeg. And lastly, it was my first climb with a super typhoon experience. Remember the typhoon Mina? It was considered to be the strongest tropical cyclone in 2011 that hit not only the Philippines but also made an impact to neighboring countries such as Taiwan and the rest of China. It's been almost two years when buddy Dennis invited me for this major Pulag climb in August 2011, and I can vividly remember each moment of such unforgettable traverse. A weekend before the event, I heard that there was a low pressure area formed and was heading to Catanduanes. Not only I, but all of us just thought that before our climb event, it must be already outside the country. As per forecast, this one which eventually became tropical depression, was heading northwest but little did we know that it was actually heading north and that it would eventually fall simultaneously with our climb schedule. This typhoon lasted for a week, caused landslides, floods and other damages. The difficulty for me was doubled because of the weather condition and even tripled because of my injury. My left knee suffered for the next 3 days. The traverse was supposed to be completed in 3 days but we got stranded in our second day because we had to let the typhoon subside. We stayed in a classroom at a school in Upper Napo, a barangay still covered by the municipality of Ambaguio. Another day was added to our schedule. It was a bit frightening that the roof of the school almost fly away due to strong winds. Well, it was a typical picture of a strong typhoon. The only thing different was that we weren't home and the fact that sooner or later, we might be far from being safe. We also had a difficulty finding stable mobile signal. All we had to do was to make some shot of liquor (as the local guides are willing to buy us one), talk, cook, eat, and sleep. We were also conscious about limiting our consumption of food supplies. We cannot resume the trek as it was one dark whole day of heavy rain, fog and wind all over the surrounding mountains. We spent two nights embracing ourselves with the whistling wind and threatening noise of typhoon Mina. On the next day, we shouted “hooray” when the sun came out and started to rise. However, on such third day which supposed to be our second one, we were not yet spared from the strike of the typhoon.Though it was only cloudy on the first half of the day, it still rained hard.The trail is more of assault and very lengthy . We passed by a number of waiting sheds. I thought the long walk wouldn’t stop. We could not take a long rest as it was very cold. There was also a scene on one of our assaults that we struggled with the very strong wind and all we could do was to lie and face down and wait for the wind to calm down. For some reason, I was feeling a good amount of joy and behaving extremely active while doing the assault with my heavy wet long pack in the middle of the threatening noise of strong rain and wind. I never got annoyed nor even felt displeased. I must be thinking I just wanted to survive and really, I should survive… and that never will I give up in that stormy situation. So long I can move myself and reach the expected destination, I would really keep on keeping no matter what. Insane I might be, but I just decided to feel the rain and keep on moving. So you could also imagine how we almost bought all the foodie stuff we could ever buy from the nearby sari-sari store upon arriving at the Ambangeg ranger station. Our strength was almost gone and we were so HUNGRY!!! We learned that we're the only group which were able to enter the Mt Pulag National Park. Hikers were actually not allowed on such stormy weekend. Those who attempted to enter via Akiki and Ambangeg were not able to do so. Perhaps, it was because of the fact that we started as early as Thursday with no evidence of a very strong typhoon and that, even our contact local officials in Ambaguio did not prohibit us. Let’s talk about the trails! Not everyone is familiar with the Ambaguio trail . From what I’ve observed, I think it is the most rarely walked trail by many climbers among all the available routes to Mt. Pulag. At least Tawangan trail, another major one, is commonly used as route for the Luzon321 climb (climb of Luzon’s Three Highest Mountains). Ambangeg and Akiki are of course two of the routes that are mostly used. 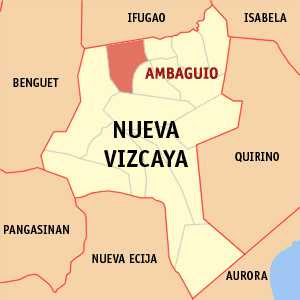 To give an overview, Ambaguio is a town in the northern part of Nueva Vizcaya that is very closed to Ifugao and Benguet, and apparently a route that has access to Mt. Pulag. The trek began from the Poblacion of the town and it is a descending rocky trail at first. This was where I got my injury and if not from the “mind over matter” principle I believe in, surely I might not be able to manage the rest of the expedition (I must say, my case wasn’t that serious but it was undeniably painful). Thankful too to one of our climbing companions, Rheys Cornilla who happened to be a Physical Therapist and acted as a "medic" person for our climb. What I like about the trail is a long expedition which make you feast a lot on the beauty of life in the mountains --- simple living of the native people, falls, rivers, hanging bridges and an immense picture of the mountainous vicinity. But of course this magnificence has an equal sacrifice of a long trek… and not just long trek but a non-stop series of assault. The trail features some edge and steep portions but generally it is not very technical. Our first stop was at the Upper Napo, the first campsite where we stayed for one night when we got stranded. If we were able to follow the itinerary for the three-day climb, we should have instead made the stop on the next one, the Lower Napo. The trails are established since these are walked on by the locals, if not daily but at least very frequent. I honestly do not know what way we have taken that led us to Ambangeg but according to Dennis, the first time they did it, the guide took them to the grassland which leads to the saddle camp site. If you happened to climb Pulag already, that portion of signage indicating Tawangan and Lusod. Remember? But he bet the one we did in this climb was shorter and we were able to arrive at the ranger station at past 3pm, if I remember it right. We were more than wet than you can imagine but good thing we had a good waterproofing of our backpacks. Much has been said already by a lot of blogs about Akiki in Kabayan, Benguet as this is a popular trail in Pulag next to Ambangeg. The only distinction of it to the latter is that is dubbed as a killer trail. Known to be a major climb but despite the difficulty it brings, it is at least compensated by a very pleasant mossy forest and a breathtaking view of pine forest. Imagine this photo of Akiki… imagine climbing it or even descend in this almost 70-degree trail and feel the stretch of your muscles upon every step for about 8-12 average hours of trekking up or 6 hours descending. I say, good luck to your knees, my friend! In this side of Mt. Pulag by the way is where you will pass by the Eddet River through a hanging bridge. By the way, we just passed by the trail at the grassland of Mt. Pulag but the guide did not permit and advise us to reach the summit. In the case of our actual climb, it should have been alright descending via Akiki… but our knees and leg and the entirety of our bodies must have been stressed out and too tired from the previous trekking under the extreme weather condition... too tired to descend in such kind of trail. Well, who’s to be blamed? Hehehe.. we were given another option to descend via Ambangeg yet we insisted to complete the traverse via Akiki and so, accept then to suffer the consequences. But good thing is, in the middle of the trek in Akiki, the storm appeared to subside already. But it was so slippery. By the way, Akiki trail is commonly paired up with Ambangeg to make a traverse on either a one- day up summit and descend via Ambangeg or 3-day climb as a more relaxing one (the first camp is to be done at Marlboro Country campsite and the next one is at saddle campsite). For you guys who are anticipating and joining climbs this wet season… let me say-- just be prepared, feel the climb and have a safe trek! Also, be brave and at the sametime, humble enough to abort a climb for your own safety.